“Certificate of birth for Thomas Chin, Omaha, Nebraska,” 1919, Chinese Exclusion Act case files, RG 85, National Archives-Seattle, Thomas Chin file, Seattle, Box 1068, Case 8715/11-20. Thomas Chin, the son of Gin Chin [Chin Ah Gin] and Unce Chin was born on 14 December 1919 at 1917 Cass Street, Omaha, Nebraska. The attending physician, C. B. Foltz, M.D. and nurse-midwives, Miss Smith and Miss Unger were from Lord Lister Hospital. [The name of the hospital is not filled out on the certificate so it was probably a home birth.] Thomas’s father was born in California and his mother in China. The birth certificate was used for proof of birth so Thomas could obtain a Certificate of Identity. The family was about to visit China and needed the proper papers so they would be re-admitted on their return to the U.S. Beside Thomas, their younger sons George Chin Gin and Carl Chin were traveling with them. According to Chin Ah Gin’s statement, in April 1891 the U.S. District Court of San Francisco, California established that Chin Ah Gin’s place of birth was San Francisco. A copy of the court document is included in his Seattle file #2792. By 1909 Chin had made four trips to China. He had to prove his citizenship every time he re-entered the U.S. On his last trip he was admitted at Portal, North Dakota. Chin Ah Gin and his wife had nine children; three were born in China and six in the United States. Their daughter Fong Yin died in Omaha about 1925. All the children were living in the United States in 1927. 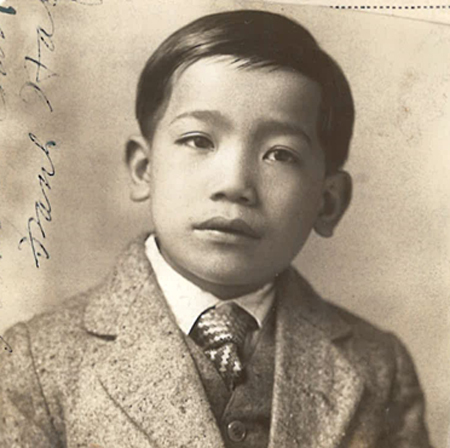 “Photo of Thomas Chin, Form 430,” 1927, Chinese Exclusion Act case files, RG 85, National Archives-Seattle, Thomas Chin file, Seattle, Box 1068, Case 8715/11-20. Thomas Chin and his family returned to Seattle, Washington on the S.S. President Grant on 9 April 1828, were admitted then went home to Omaha, Nebraska. The file does not give any information on how they traveled from Seattle to Omaha. Chin Ah Gin owned and managed the Mandarin Café at 1409 Douglas Street in Omaha.